Cultivated land covers about 28 million hectares, equivalent to 35.8% of the country’s total area. Although 15.5 million hectares are irrigable, technical and economic constraints mean that only 8.5 million hectares can actually be irrigated. According to 2013 statistics, 5.42 million hectares of the irrigable land is under irrigation. 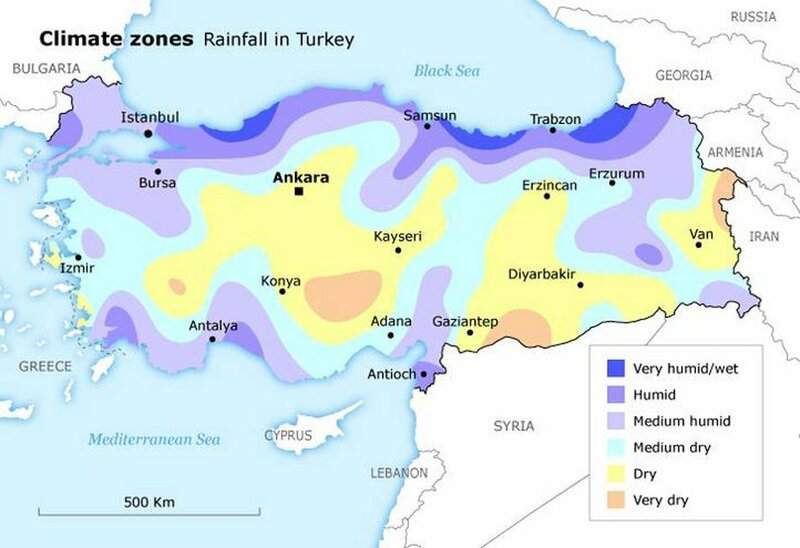 Overall, Turkey’s climate is characterised as semi-arid, although nine types of climate can be distinguished: Mediterranean, wet Mediterranean, partially wet Mediterranean, Black Sea, partially wet Marmara, steppe, partially dry central Anatolian, partially dry south-east Anatolian and continental east Anatolian. Average annual rainfall is 643mm. Annual precipitation reaches 1,000-2,500mm in the mountainous coastal regions, with the highest rainfall (1,260-2,500mm per year) occurring in the Black Sea region. Central Anatolia has the lowest rainfall (200-600mm) which, combined with high temperatures and high evaporation rates, results in drought during the summer months. South-eastern Anatolia has precipitation of 350-500mm per year, and Marmara, the Aegean regions and the Eastern Anatolia plateaus 500-1,000mm. Turkey’s population was 20.95 million in 1950. By 2015, this number had risen to 78.74 million, of which around 30% is rural, and is predicted to reach 84.25 million in 2023 and up to 93.50 million in 2050. After 2050, the population is expected to decline again, dropping to approximately 89.20 million in 2075. Gross domestic product (GDP) is $799.54 billion, making Turkey the 17th largest economy in the world. Per capita income exceeds $10,500. In 2014, the agricultural sector contributed around 8.03% to GDP, whereas 27.08% of the economic value added originated from industry and 64.89% from the service sector. Agriculture’s contribution to GDP was 12% in 1995. The decline in the agricultural sector has affected the share of agriculture in total employment, which was 43% in 1995 but only 24% in 2010. DSI, Water and DSI, 2013, Ankara, p.18. FAO, 2009, Irrigation in the Middle East Region in Figures, FAO, Rome, p.355. DSI, Water and DSi, 2013, Ankara, p.19; Aysegul Kibaroglu, Waltina Scheumann, Annika Kramers (ed. ), 2011, Turkey’s Water Policy: National Frameworks and International Cooperation, Springer, p.96. Munir Ozturk, Salih Gucel, Mahir Kucuk and Serdal Sakcali, 2010, Forest diversity, climate change and forest fires in the Mediterranean region of Turkey, Journal of Environmental Biolog, 31, 1-9. FAO, 2009, Irrigation in the Middle East Region in Figures, FAO, Rome, p.355; DSI, Land and Water resources, http://en.dsi.gov.tr/land-water-resource. TUIK – Turkish Statistical Institute, 2016. Agriculture Policy Monitoring and Evaluation 2011, OECD Countries and Emerging Economies, OECD, OECD Publishing, 2011, p. 193.